What it takes to leave an impression or get a click! When used correctly, online marketing banner ads are still a great way to advertise. Need a refresher? 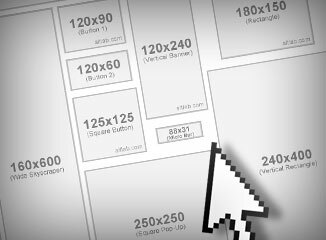 The top 3 best sizes for banner ads with the greatest click through rates are: the leaderboard with dimensions of 728 x 90 pixels, the square at 300 x 250, and thirdly, the most popular option is the skyscraper with dimensions of 160 x 600 pixels.Yes, banner ads can be annoying. At times, direct mail, television commercials and email are too. However, when sized up properly in a marketing plan, banner ads can still leave quite an impression.